Contributed by Jogyata Dallas, the following interview considers the growing phenomenon of veganism and vegetarianism in New Zealand, recorded in conversation with one of it’s very keen advocates from the Sri Chinmoy Centre. Q: What led you to become a vegetarian then vegan? A: I started out on a personal journey of discovery, one that’s really part of a much larger inquiry, a global awakening about health. I read up on the benefits of a vegan or vegetarian diet which are well documented and compelling and I began to feel so much healthier almost straight away. Even recent NZ Herald coverage has looked at the mounting evidence of the health positives, and mentioned the link between high animal protein diets with the rise of colon cancers and numerous other health disabilities. Of course I’m always being challenged because the old myths are still there, milk needed for heathy bones and calcium, animal protein for sound nutrition and so on, but they’ve been rigorously disproved – it takes a while though to get past all this to the facts. Q: Do you really think the vegan diet can become popular in a country like New Zealand? A: It’s happening now, and much faster than you think. 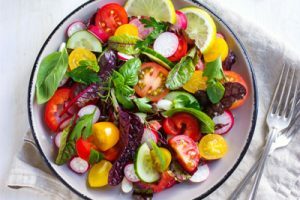 Vegetarians and vegans are rapidly growing in numbers – it’s part of a consciousness shift that you can see in the bigger global canvas, an incoming tide of knowledge and change, the interest in mindfulness and spirituality, vegetarian schools, the scores of online websites dedicated to raw food, green smoothies, fasting, yoga and health. We’re taking more note of the environmental aspects of it all as well, the huge and unsustainable misuse of land and the massive environmental footprint of the agri-businesses. Q: And you practise meditation too – where’s the link here? A: Mind and body are inseparable – in looking for optimal health you can’t focus only on one and neglect the other. A lot of meditators are vegetarian because it helps us to have a more calm and peaceful mind. Ayurvedic medicine talks about the rajasic, tamasic and sattvic qualities of food, the type of body energies we have in the subtle realms. These principles have been known for thousands of years. Vegan and vege foods enable the deeper, subtler experiences in meditation. I meditate with the Sri Chinmoy Centre – there are 6,000 vegetarians in our organisation worldwide, all super-healthy people who run marathons, treat the body as a body-temple. Q: You mentioned the environmental impact of farming and that’s quite a topic right now. Even the United Nations has identified land based animal farming as the leading driver of environmental degradation. A: It’s true. A World Bank report stated that animal agriculture is producing 51% of of all greenhouse gas emissions, and is the number one contributor to human caused climate change. Researchers also agree that the primary cause of loss of species – the largest widespread extinction of species we’ve seen since the age of the dinosaurs – is caused by habitat loss and overgrazing from livestock production. Our last rainforests like the Amazon are disappearing at the rate of one acre every second to enable beef and dairy farming, soya crops – and palm plantations are wiping out the last Indonesian rainforests and causing many extinctions. In New Zealand there’s a lot of concern too at the degradation of our lakes and rivers and coastal waterways caused by farm run-off. And look at the global epidemic of diet based, high animal protein health problems – cancer, obesity, coronaries etc. It’s all reversible! Q: In NZ and a lot of western societies agri-businesses are fundamental to our economy. News that milk and meat production are driving climate change, environmental degradation, species extinctions, health problems and so on will unleash a real firestorm of resistance. A: Yes, it will take a long time for the inevitable changes to go mainstream or bring about a shift in our way of living. But there are moral issues as well – it has often been pointed out that the acreage and resources required to produce a kilo of beef or mutton or a litre of milk can produce between fifteen to twenty times more plant based protein. There are over 210,000 people being born on our planet every day – the present systems can’t feed them all. A US report I saw stated that one and a half acres of arable land in a single year can produce 13,810 kg (37,000 lbs) of vegetables, but only 140 kg (375 lbs) of meat. In a world where food shortage is a growing problem, the implications of this are obvious. There are almost one billion hungry people on this planet – 82% of starving children live in countries where vast amounts of grain and food are fed instead to animals that are raised to feed the wealthy. We are heading towards food wars, water wars, arable land wars, mass migrations of people to liveable climates and away from rising sea levels. Q: Do you really see significant changes soon happening? A: We might be on the verge of an evolutionary jump, perhaps one forced upon us through necessity. The outcry of agri-businesses – the number one polluters and environmental wreckers on our planet – will fade away, just as the outcry against the right of women to vote or outrage at the abolition of slavery faded away. I also believe in the goodness of human beings, something better and higher that we have within us. The majority of vegans are also conscious of the enormous scale of suffering that human beings inflict on virtually every other furred, feathered and marine creature on our planet. Q: Veganism – is it a modern phenomenon? A: No, not really. You can see it in different cultures way back in time. In India the Jains have an ecological philosophy synonymous with ahimsa or non-violence. Ahimsa is the principle of compassion and responsibility, practised not only towards human beings but towards all animals and nature itself. For them there is no greater virtue than reverence for life because as a highly evolved form of life ourselves, we are seen to have a great moral responsibility in our guardianship of the planet. But we are instead the most terrifying predator earth has ever seen, numbed down by habit and culture to the accepted exploitation of all other species, thought to include over 100 billion land animals annually. Perhaps it is time when the growing sensibilities of our race will include, as the Buddha proposed 2,500 years ago, a widening compassion for all other creatures, including man, on our planet. “Nothing will benefit human health and increase the chances for survival of life on Earth as much as the evolution to a vegetarian diet.” – Albert Einstein. Is your reservation for a special occasion?